One of Sandy Gonzalez’s earliest memories from Aculco, Mexico, is about confinement and abandonment. She might have been 4 years old when she woke up alone at home and trapped indoors. She panicked and cried for what felt like hours until her uncle Martín finally came. “He opened the door for me. I don’t know why that memory has stuck with me,” she said. The scene would come back to her later, when Martín was the first familiar face to greet her inside of California. At age 6, understanding little of what was happening, Gonzalez was taken from central Mexico on a three-day journey to Pasadena, where her mother already lived. “Here, take your clothes,” said Mami Mago, her grandmother. Today, as a Cal Lutheran sophomore and a U.S. permanent resident, Gonzalez is grateful for all of the doors open to her. The first person in her family to attend college, she intends to earn a Ph.D. in psychology. She’ll apply to become a U.S. citizen in a few years. Last October, she won a $10,000 GoFundMe Scholarship, one of the first 10 ever awarded by the online platform for social fundraising. Together with financial aid from Cal Lutheran, the scholarship has made this academic year far easier on her and her hard-working grandmother. Things were not always so hopeful. 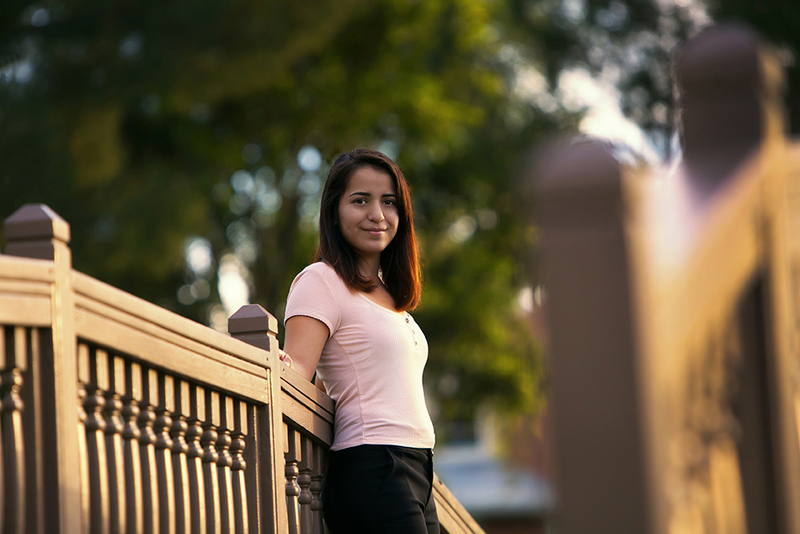 Until she received her green card as a junior in high school, Gonzalez lived with a sense of limited possibilities, like someone trapped inside walls. “That is what opened my eyes. Wow, I could actually be someone. I could actually work somewhere besides a minimum-wage job,” she said. A sad circumstance allowed Gonzalez to apply for U.S. residency. Shortly before her eighth birthday, she was left behind in her grandmother’s care when her mother returned to Mexico with her baby half-brother and his father. Growing up, Gonzalez couldn’t shake the belief that she’d done something to deserve her mother’s abandonment. “If I had only been a better daughter, maybe she would have stayed,” Gonzalez wrote in her essay on the GoFundMe website, expressing how she felt about her mother’s starting a new family without her. When the Obama administration started the Deferred Action for Childhood Arrivals program in 2012, offering temporary safety from deportation for certain immigrants, Gonzalez did not apply. She and Mami Mago were advised that the special case of abandonment in a foreign country would make it possible to shoot for permanent residency instead. But first, the grandmother had to get legal guardianship of Gonzalez. That led to the youngster’s seeing a document by which her mother had formally relinquished custody of her. To begin a process of reconciliation, Gonzalez has now visited her mother once in Mexico. It’s not easy, but she says that her education in psychology has been helpful. “It’s made me see different perspectives, and maybe her side as well,” she said. When Gonzalez was born, her mother was about the age that she is today. Gonzalez wants to understand her own coming of age, and is leaning toward child development as an eventual academic specialization. Becoming a therapist could give her the chance to help other kids. She hopes it will also provide the financial stability that Mami Mago has always wanted for her.